"Slavic god/deity" redirects here. For the Slavic conception of supreme God, see Rod (Slavic religion). For the theology of modern Slavic Native Faith, see Slavic Native Faith's theology and cosmology. A shrine of Svarog in Bitsa Park, Moscow. Rod, in its symbolisation of the generative process, has been compared to the Celtic Toutatis (cf. *teutā, "stock", "tribe"), and to the Latin Quirinus, the god of community and procreation (cf. *coviria, cūria). According to Émile Benveniste's definition of the Italic god of generation, it is the "god of the growth of the nation". As supreme God, Rod has also been compared to the Latin Saturn. The iconography of Rod shows him governing the four elements: He stands on a fish, symbol of water; with one hand he heightens a wheel, symbol of the sun and of the cycles of the universe; with the other hand he holds a bucket of flowers, symbol of the blooming earth; and around his waist he has a fluttering linen belt, symbol of air. Basic information from Mathieu-Colas 2017. Further information is appropriately referenced. –Pya Literally, respectively, "White God" (cf. bieli, "white") and "Black God" (cf. cherni, "black"). They represent the oppositional and complementary duality which inheres reality, expressed for instance as light and darkness, day and night, male and female. Belobog incarnates as Svarog ("Heaven") and the multitude of his manifestations (cf. "threefold–fourfold divinity" hereinbelow), while Chernobog incarnates as Veles (also called Tjarnaglofi, i.e. "Black Head") and female deities. All deities are manifestations of either Belobog or Chernobog, and in both categories they may be either Razi, rede-givers, or Zirnitra, dragon wizards. Black gods were usually represented with the features of fierce animals. –Udelnica (north Russian) Literally "God and the Goddess", it is a conceptualisation of the supreme polarity as male–female, formed by the masculine form plus the feminine form of the root *rod; it implies the union of the supreme God with matter to shape reality. The feminine form is frequently spelled plural, interpreting Rozanica as the collective representation of the three goddesses of fate. Rozanica is an ancient mother goddess, and her name literally means the "Generatrix" or "Genitrix". In kinships, while Rod represents the forefathers from the male side, Rozanica represents the ancestresses from the female side. Through the history of the Slavs, the latter gradually became more prominent than the former, because of the importance of the mother to the newborn child. She is also called Deva, meaning the "Young Lady" or simply "Goddess", regarded as the singular goddess of whom all lesser goddesses are manifestations; Baba, meaning the "Old Lady", "Crone", "Hag"; and Krasopani, meaning the "Beautiful Lady". She has been compared to the Greek Aphrodite and the Indic Lakshmi, but especially to the Roman Juno, female consort of the supreme God, whom collectively represented the Junones, the Norse Disir, the spirits of female lineages who determined fate. The north Russian name Udelnica means "Bestower" (of fate). The ancient Slavs offered bread, cheese and honey to Rod–Rozanica. –Percunust (Germanised Wendish) M Perun literally means "Thunder" but also "Oak", and he is the son of Svarog, worshipped as the god of war. He is related to the Germanic Thor and other Indo-European thunder gods. In Christianised folk religion he is equated with Saint Elias. He is the opposite polarity of Veles, the male god of the earth. In some traditions, he has a mother, Percunatele (a goddess inherited from Baltic traditions), and a sister Ognyena ("She of the Fire"). Perun is the personification of the active, masculine force of nature, and all the bright gods are regarded as his aspects, or different phases during the year. His name, which comes from the Indo-European root *per or *perkw ("to strike", "splinter"), signifies both the splintering thunder and the splintered tree (especially the oak; the Latin name of this tree, quercus, comes from the same root), regarded as symbols of the irradiation of the force. This root also gave rise to the Vedic Parjanya, the Baltic Perkunas, the Albanian Perëndi (now denoting "God" and "sky"), the Norse Fjörgynn and the Greek Keraunós ("thunderbolt", rhymic form of *Peraunós, used as an epithet of Zeus). Perun has also been compared to the Indic Brahma, and together with Potrembog (Vishnu) and Peklabog (Shiva), as a component of the Triglav interpreted as the equivalent of the Indic Trimurti. Traditional iconography shows Perun with a head surrounded by ten beams of light, with two faces—that of a man on the front side, and that of a lion on the back side–, and holding a plough in front of him. Both the sun god and the moon god, Dazhbog and Jutrobog, are often qualified as "Xors"[δ], a title which finds many equivalents in Indo-Iranian (cf. Persian xursid, xorshid) and means "radiant", referring to the radiance of solar and lunar light. Its etymology probably goes back to the Indo-European root *ghers, and Indo-Aryan *hrs, *ar, *r, comprising the semantic field of "to move rightly", "upwardly", and "to praise". Male solar deities are generally assumed to be descended from the Zoroastrian Hvare-khshaeta on the basis of etymology, though this has been contested. Conversely, the sun is usually depicted as female in Slavic folklore (cf. Baltic Saulė). In Slavic religion, everything has a spirit or soul, including houses, lakes, mountains, forests, animals and men. These spirits are generally called by various terms, including for instance zduh or zduhacz ("spirit") by the Serbs, or sjen or sjenovik ("shadow") by the Montenegrins. These spirits are considered able to leave the body during the sleep, wandering about the world, the skies and the underworld. –Samodiva, Samovila, Vila, Iuda (Bulgarian) F Boginka literally means "Little Goddess". Always described as plural, boginky ("little goddesses"), they are tutelary deities of waters. They are distinguished into various categories, under different names, and they may be either white (beneficent) or black (maleficent). The root *nav which is present in some name variants, for instance Navia and Mavka, means "dead", as these little goddesses are conceived as the spirits of dead children or young women. They are represented as half-naked beautiful girls with long hair, but in the South Slavic tradition also as birds who soar in the depths of the skies. They live in waters, woods and steppes, and they giggle, sing, play music and clap their hands. They are so beautiful that they bewitch young men and might bring them to death by drawing them into deep water. They have been compared to the Greek Nymphs. –Morozko Moroz is the deity of the cold (cf. moroz, "frost"). He is the brother of Perun and Chernobog. In the Kalevala of the Finnish mythology is also a "Frost" named figure (Pakkanen), a son of Louhi. –Volossatka M–F Domovoy is the household god, warden of the hearth. The Indo-European root *dom is shared by many words in the semantic field of "abode", "domain" (cf. Latin domus, "house"). Domania is sometimes present as his female counterpart, but he is most often a single god. According to the Russian folklorist E. G. Kagarov, Domovoy is a conceptualisation of the supreme Rod itself as the singular kin and its possessions. Domovoy are deified fountainhead ancestors, and all other household deities with specific functions are their extensions. Domovoy may manifest in the form of animals, such as cats, dogs or bears, but also as the master of the house or a departed ancestor of the given kin. In some traditions they are symbolised as snakes. 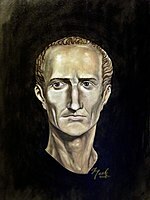 They have been compared to the Roman Di Penates, the genii of the family, and they were worshipped by the Slavs as statuettes which were placed in niches near the house's door, and later above the ovens. Other household gods are ① Dvorovoy (tutelary deity of courtyards), ② Bannik ("Bath Spirit", tutelary deity of the sauna who corresponds to the Komi Pyvsiansa) and ③ Ovinnik ("Threshing Barn Spirit"), ④ Prigirstitis (known for his fine hearing), and the goddess ⑤ Krimba among Bohemians. Another household deity is the lizard-shaped Giwoitis. 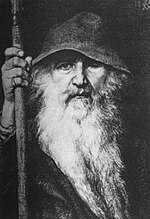 The Wends, including those who dwelt in modern-day northern and eastern Germany and were later Germanised, or other never-Germanised West Slavs, also worshipped deities adopted from Germanic religion, as documented by Bernhard Severin Ingemann. However, Germanic gods never rose to prominence over Slavic ones in Wendish religion. Romantic (fictitious) illustrations of Slavic deities, in "Historia Lusatica", Acta Eruditorum, Calendis Aprilis 1715. Romantic (fictitious) illustrations of Slavo-Saxon deities, in Saxonia Museum für saechsische Vaterlandskunde, 1834. ^ a b c d e f g h i Absence of these symbols in Historical Slavic religion: Шнирельман В. А. Арийский миф в современном мире. Новое литературное обозрение, 2015. Библиотека журнала «Неприкосновенный запас»; Some of the latter are found, for instance, in: Kushnir, Dimitry (2014). Slavic Light Symbols. The Slavic Way. 5. ISBN 9781505805963. ^ Deivos, cognate with the Proto-Indo-European *Dyeus, is the most ancient name of the Slavic supreme God of Heaven (cf. Sanskrit Deva, Latin Deus, Old High German Ziu and Lithuanian Dievas). This name was abandoned when Slavic religion, in line with Proto-Indo-Iranian religion, shifted the meaning of the Indo-European descriptor of heavenly deities (Avestan daeva, Old Church Slavonic div, both going back to Proto-Indo-European *deiwos, "celestial") to the designation of evil entities, and in parallel began to describe gods by the term for both "wealth" and its "givers" (Avestan baga, Old Church Slavonic bog). At first it was replaced with the term for "clouds", cf. Old Church Slavonic Nebo. ^ Boris Rybakov identifies all wheel, whirl and spiral symbols as representing Rod in its many forms, including the "six-petaled rose" and the "thunder mark" (gromovoi znak), the latter most often associated to Perun. The contemporary design of the symbol called kolovrat, the eight-spoked wheel used as the collective symbol of Rodnovery, was already present in woodcuts produced in the 1920s by the Polish artist Stanisław Jakubowski under the name słoneczko ("little sun"). ^ a b c d Gasparini 2013. ^ Rudy 1985, p. 5. ^ Mathieu-Colas 2017; Rudy 1985, p. 5. ^ Rudy 1985, pp. 5, 14–15. ^ Leeming 2005, pp. 359–360; Rudy 1985, p. 9. ^ Gasparini 2013; Hanuš 1842, pp. 151–183; Heck 1852, pp. 289–290. ^ Ivakhiv 2005, p. 214. ^ Rudy 1985, pp. 17–18. ^ Rudy 1985, pp. 24–25. ^ a b c Rudy 1985, p. 9. ^ Gasparini 2013; Rudy 1985, p. 4. ^ Rudy 1985, p. 31. ^ Hanuš 1842, p. 116; "...Krodo, dem Slawen-Gotte, dem grossen Gotte...", trans. : "...Krodo, the God of the Slavs, the great God...". ^ Hanuš 1842, p. 116. ^ a b c d e f g h i j k l m n o p q r s t u v w x y z aa ab ac ad ae af ag ah ai aj ak al am an ao ap aq ar as at au av aw ax ay az ba bb bc bd be bf bg bh bi bj bk bl bm bn bo bp bq br bs bt bu bv bw bx by bz ca cb cc cd ce cf cg ch ci cj ck cl cm cn co cp cq cr cs ct cu cv cw cx cy cz da db dc dd de df dg dh di dj dk dl dm dn do dp dq dr ds dt du dv dw dx dy dz ea eb ec ed ee ef eg eh ei ej ek el em en eo ep eq er es et eu ev ew ex ey ez fa fb fc fd fe ff fg fh fi fj fk fl fm fn fo fp fq fr fs ft fu fv fw fx fy fz ga gb gc gd ge gf gg gh gi gj gk gl gm gn go gp gq gr gs gt gu gv gw gx gy gz ha hb hc hd Mathieu-Colas 2017. ^ Ivanits 1989, pp. 14–17. ^ Rudy 1985, pp. 14–15. ^ Hanuš 1842, pp. 115–116. ^ Pietzsch, Edward, ed. (1935). Museum für sächsische vaterlandskunde. 1–5. p. 66. ^ a b c Ivanits 1989, p. 17. ^ Stanisław Jakubowski (1923). Prasłowiańskie motywy architektoniczne. Dębniki, Kraków: Orbis. Illustrations of Jakubowski's artworks. ^ a b c Creuzer & Mone 1822, p. 197. ^ a b c d e f Ingemann 1824. ^ a b c d e f g h Heck 1852, p. 291. ^ a b c d e f g h i j k l m n o p q Leeming 2005, p. 360. ^ Creuzer & Mone 1822, pp. 195–197; Heck 1852, pp. 289–290. ^ Rudy 1985, p. 8; Máchal 1918, p. 249. ^ a b c d e Hanuš 1842, p. 135. ^ a b Marjanić 2003, pp. 193, 197–199. ^ a b c d e f g h i j Máchal 1918, p. 250. ^ Mathieu-Colas 2017; Rudy 1985, p. 8. ^ a b c Máchal 1918, p. 249. ^ Hanuš 1842, pp. 135, 280. ^ a b c Marjanić 2003, p. 181. ^ a b c d Marjanić 2003, p. 193. ^ Marjanić 2003, p. 186. ^ a b Marjanić 2003, pp. 181, 189–190. ^ a b c Marjanić 2003, p. 194. ^ a b c d e Hanuš 1842, p. 279. ^ Máchal 1918, p. 355, note 44. ^ Marjanić 2003, p. 182. ^ Máchal 1918, pp. 287 ff. ^ Trkanjec 2013, p. 17. ^ a b Dynda 2014, p. 59. ^ Dynda 2014, p. 63. ^ Dynda 2014, p. 74. ^ a b c Rudy 1985, pp. 27–29. ^ a b c Rudy 1985, pp. 7–8. ^ a b c d e f g Leeming 2005, p. 359. ^ a b c d Hanuš 1842, p. 160. ^ Ingemann 1824; Hanuš 1842, pp. 160–161. ^ a b c d e Rudy 1985, p. 17. ^ Rudy 1985, p. 19. ^ Hanuš 1842, p. 99. ^ a b Rudy 1985, p. 6. ^ a b c Marjanić 2003, p. 190. ^ Rudy 1985, pp. 17–21. ^ Rudy 1985, pp. 5–6. ^ Hanuš 1842, pp. 219 ff. ^ a b c Heck 1852, p. 290. ^ a b Mathieu-Colas 2017; Hanuš 1842, p. 171. ^ Leeming 2005, p. 359; Hanuš 1842, p. 171. ^ Hanuš 1842, pp. 171, 180. ^ Hanuš 1842, p. 171. ^ Mathieu-Colas 2017; Rudy 1985, p. 18. ^ Máchal 1918, p. 286. ^ a b c Rudy 1985, p. 7. ^ Khmara, Anatoly Vladimirovich (2008). Образование: гуманитарные дисциплины, творчество и созидание [Education: Humanities, Creativity and Creation]. Образование через всю жизнь: непрерывное образование в интересах устойчивого развития (Education Throughout Life: Continuing Education for Sustainable Development). p. 68. ^ a b c Rudy 1985, p. 29. ^ Borissoff 2014, p. 9, note 1. ^ Máchal 1918, pp. 296 ff. ^ Rudy 1985, p. 8; Szyjewski 2003, pp. 108–109. ^ Grzegorzewic, Ziemisław (2016). O Bogach i ludziach. Praktyka i teoria Rodzimowierstwa Słowiańskiego [About the Gods and people. Practice and theory of Slavic Heathenism] (in Polish). Olsztyn: Stowarzyszenie "Kołomir". p. 78. ISBN 9788394018085. ^ Borissoff 2014, p. 23, 29. ^ Borissoff 2014, pp. 11–12. ^ Robbins Dexter, Miriam Robbins (1984). "Proto-Indo-European Sun Maidens and Gods of the Moon". Mankind Quarterly. 25 (1–2). pp. 137–144. ^ a b Rudy 1985, p. 30. ^ Hanuš 1842, pp. 177–180. ^ a b Hanuš 1842, p. 177. ^ a b c Hanuš 1842, p. 180. ^ Buttmann, Alexander (1856). Die deutschen Ortsnamen: mit besonderer Berücksichtigung der ursprünglich wendischen in der Mittelmark und Niederlausitz. F. Dümmler. p. 168. ^ a b c d e f g h i Hanuš 1842, p. 280. ^ a b Wagener 1842, p. 626. ^ Rudy 1985, p. 22; Hanuš 1842, p. 279. ^ a b c Mathieu-Colas 2017; Leeming 2005, p. 360. ^ Hanuš 1842, pp. 279–281. ^ a b c d e f g h i j Rudy 1985, p. 22. ^ a b c d Rudy 1985, p. 24. ^ Rudy 1985, p. 23. ^ Ivanov, Vyacheslav; Toporov, Vladimir (1994). "Славянская мифология" [Slavic mythology]. Российская энциклопедия (Russian Encyclopedia). ^ a b Rudy 1985, pp. 23–24. ^ Mathieu-Colas 2017; Gasparini 2013. ^ Marjanić 2003, pp. 190–191. ^ Leeming 2005, p. 360; Marjanić 2003, p. 191, note 20. ^ Ingemann 1824; Heck 1852, p. 291. ^ Kanngiesser 1824, p. 202. ^ Mathieu-Colas 2017; Kanngiesser 1824, p. 202. ^ Dixon-Kennedy 1998, p. 156. ^ a b Zhuravylov 2005, p. 239. ^ a b Zhuravylov 2005, p. 240. ^ Marjanić 2003, p. 193, note 27. ^ a b Rudy 1985, p. 25. ^ Boryna, Maciej (2004). Boski Flins na Dolnym Śla̜sku, Łużycach i w Saksonii [Divine Flins in Lower Silesia, Lusatia and Saxony]. Szprotawa: Zielona Góra Eurodruk. ^ Kanngiesser 1824, p. 205. ^ Hubbs 1993, p. 64. ^ a b c d Borissoff 2014, p. 25. ^ a b Hanuš 1842, p. 275. ^ a b c d e f g h i Hanuš 1842, pp. 218–219. ^ Mathieu-Colas 2017; Hanuš 1842, pp. 98–99. ^ Leeming 2005, p. 359; Rudy 1985, p. 18. ^ a b c d Hanuš 1842, pp. 216–218. ^ a b Rudy 1985, p. 18. ^ Mathieu-Colas 2017; Rudy 1985, p. 30. ^ a b c Hanuš 1842, pp. 368–369. ^ a b Rudy 1985, pp. 34–35. ^ Ivanits 1989, pp. 13, 17. ^ Rudy 1985, pp. 42–45. ^ a b Hanuš 1842, p. 172. ^ Mathieu-Colas 2017; Hanuš 1842, p. 180. ^ Hanuš 1842, p. 176. ^ Rudy 1985, pp. 7, 18. ^ Máchal 1918, p. 251. ^ Máchal 1918, pp. 251–252. ^ Máchal 1918, p. 252. ^ Husain 2003, p. 170. ^ Máchal 1918, pp. 227–228. ^ The hypothesis that Berehynia is a major goddess is argued by Halyna Lozko, leader of the Federation of Ukrainian Rodnovers. Cf. Lozko, Halyna (17 October 2002). "Берегиня: Богиня чи Русалка?" [Bereginia: Goddess or rusalka?]. golosiyiv.kiev.ua. Archived from the original on 20 July 2011. ^ Ivanits 1989, p. 78. ^ Rudy 1985, p. 21. ^ a b Máchal 1918, p. 270. ^ Máchal 1918, pp. 270–271. ^ a b c Máchal 1918, p. 253. ^ Máchal 1918, p. 254. ^ a b Máchal 1918, p. 256. ^ a b Arnaudov 1968. ^ Máchal 1918, p. 259. ^ Máchal 1918, pp. 253–255. ^ Máchal 1918, pp. 256–259. ^ a b c Dal 1863, p. 2652. ^ a b c Máchal 1918, p. 261. ^ a b c Hanuš 1842, pp. 172–173. ^ a b Cherepanova 1983, p. 30. ^ Máchal 1918, p. 262. ^ a b Афанасьев — Народные русские сказки А. Н. Афанасьева. В 3-х тт. — Т. 1. — Москва, 1984. — С. 117. ^ a b c Мадлевская Е. Л. (2000). "Образ Деда Мороза и современные представления о нём" (4, 2000) (Живая старина ed.). М.: Гос. республиканский центр русского фольклора: 37–39. ^ Máchal 1918, p. 269. ^ a b c Máchal 1918, p. 267. ^ a b c d e f g Máchal 1918, p. 244. ^ Máchal 1918, p. 240. ^ a b c Máchal 1918, p. 245. ^ a b c d Máchal 1918, p. 246. ^ Máchal 1918, p. 241. ^ Ivanits 1989, p. 61. ^ Máchal 1918, pp. 240–241. ^ Ivanits 1989, p. 58. ^ Dynda 2014, p. 61. ^ Marjanić 2003, p. 192. ^ Ingemann 1824; Hanuš 1842, p. 381. ^ a b Hanuš 1842, p. 381. Cherepanova, Olga Aleksandrovna (1983). Мифологическая лексика русского Севера [Mythological vocabulary of the Russian North] (in Russian). Leningrad University. Dal, Vladmir Ivanovich (1863). Толковый словарь живого великорусского языка [Explanatory Dictionary of the Living Great Russian Language] (in Russian). Consulted 2014 edition by Directmedia. Borissoff, Constantine L. (2014). "Non-Iranian origin of the Eastern-Slavonic god Xŭrsŭ/Xors" (PDF). Studia mythologica Slavica. 17. Institute of Slovenian Ethnology. pp. 9–36. ISSN 1408-6271. Archived from the original (PDF) on 12 February 2018. Dixon-Kennedy, Mike (1998). Encyclopedia of Russian and Slavic Myth and Legend. Santa Barbara, California: ABC-CLIO. ISBN 9781576070635. Heck, Johann Georg (1852). "The Slavono-Vendic Mythology". Iconographic Encyclopaedia of Science, Literature, and Art. 4. New York: R. Garrigue. pp. 289–293. Hubbs, Joanna (1993). Mother Russia: The Feminine Myth in Russian Culture. Bloomington: Indiana University Press. ISBN 9780253115782. Husain, Shahrukh (2003). The Goddess: Power, Sexuality, and the Feminine Divine. University of Michigan Press. ISBN 9780472089345. Ingemann, B. S. (1824). Grundtræk til En Nord-Slavisk og Vendisk Gudelære [Fundamentals of a North Slavic and Wendish mythology] (in Danish). Copenhagen. Kanngiesser, Peter Friedrich (1824). Bekehrungsgeschichte der Pommern zum Christenthum: Die heidnische Zeit. Geschichte von Pommern bis auf das Jahr 1129 (in German). 1. Universität Greifswald. Leeming, David (2005). The Oxford Companion to World Mythology. Sydney: Oxford University Press. ISBN 9780190288884. Máchal, Jan (1918). "Slavic Mythology". In L. H. Gray (ed.). The Mythology of all Races. III, Celtic and Slavic Mythology. Boston. pp. 217–389. Marjanić, Suzana (2003). "The Dyadic Goddess and Duotheism in Nodilo's The Ancient Faith of the Serbs and the Croats" (PDF). Studia mythologica Slavica. 6. Institute of Slovenian Ethnology. pp. 181–204. ISSN 1408-6271. Archived from the original (PDF) on 18 September 2016. Mathieu-Colas, Michel (2017). "Dieux slaves et baltes" (PDF). Dictionnaire des noms des divinités. France: Archive ouverte des Sciences de l'Homme et de la Société, Centre national de la recherche scientifique. Archived from the original (PDF) on 4 August 2017. Retrieved 24 May 2017. Robbins Dexter, Miriam Robbins (1984). "Proto-Indo-European Sun Maidens and Gods of the Moon". Mankind Quarterly. 25 (1–2). pp. 137–144. Szyjewski, Aleksander (2003). Religia Słowian [The Religion of the Slavs] (in Polish). Kraków: Wydawnictwo WAM. ISBN 9788373182059. Trkanjec, Luka (2013). "Chthonic aspects of the Pomeranian deity Triglav and other tricephalic characters in Slavic mythology" (PDF). Studia mythologica Slavica. 16. Institute of Slovenian Ethnology. pp. 9–25. ISSN 1408-6271. Archived from the original (PDF) on 27 December 2015. Wagener, Samuel Christoph (1842). Handbuch der vorzüglichsten, in Deutschland entdeckten Alterthümer aus heidnischer Zeit; beschrieben und versinnlicht durch 1390 lithographirte Abblidungen (in German). Voigt. Zhuravylov, Anatoly Fedorovich (2005). Язык и миф. Лингвистический комментарий к труду А. Н. Афанасьева "Поэтические воззрения славян на природу" [Language and myth. Linguistic commentary on the work of A. N. Afanasyev "Poetic views of the Slavs on nature"] (PDF). Традиционная духовная культура славян (Traditional spiritual culture of the Slavs) (in Russian). Indrik, Institute for Slavic Studies of the Russian Academy of Sciences. Arnaudov, Mihail (1968). Отчерци по българския фолклор [Snapshots of Bulgarian Folklore] (in Bulgarian). I том 1. Sofia: Проф. Марин Дринов, 1996. ISBN 9544304622. Arnaudov, Mihail (1968). Отчерци по българския фолклор [Snapshots of Bulgarian Folklore] (in Bulgarian). II том 2. Sofia: Проф. Марин Дринов, 1996. ISBN 9544304630.